"To ASGSB members: Please submit your abstract for the 2006 Annual Meeting. The deadline for submission is July 7, 2006, and abstracts can be submitted via the society's homepage (http://www.asgsb.org/)." "A four-person team departs today for an expedition to the top of the world, where mineral-rich waters seep from the top of a 200-meter-thick glacier. Sulfur-bearing compounds precipitate from the waters and stain the glacial ice of Borup Fiord Pass, marking the locations of the springs with bright yellow splotches that are easily visible from the air. The place calls to mind the ruddy, sulfur-rich stains on the surface of Jupiter's moon Europa, and one of the expedition members is traveling there to gather samples and data that will help with the planning of future Europa missions." The Minority Institution Research Support (MIRS) Program is pleased to announce the selection of Michael Ceballos of Salish Kootenai College (Pablo, Montana) to participate in a faculty sabbatical in virology with Ken Stedman of Portland State University, co-chair of the NAI Virus Focus Group and Forest Rohwer, of San Diego State University. The MIRS program, funded by NAI, provides opportunities for researchers, from qualified minority serving institutions, to initiate joint partnerships with researchers in the field of astrobiology. In conjunction with the 2006 GRC Origin of Life conference, organizers are offering the first Origin of Life Graduate Research Seminar. The Graduate Research Seminar is designed to identify top young talent in diverse fields and encourage them to present cutting edge research in origin of life contexts. Keith: We are going to give it a try this morning, the weather looking a bit better. The conditions at Expedition appear somewhat wet so we will take the twin to a gravel strip at Strand Fiord and will then ferry our gear to our camp at Expedition Fiord by helicopter. If we cannot make it in, we will head to Eureka for a few days. I'll try to give you a ring via sat phone later if possible for an update. 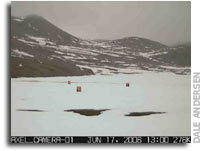 Our studies of the perennial springs, massive ground ice and pingos will begin shortly. Keith: We arrived in Resolute Friday evening but we are still in here awaiting better weather. Its been cloudy with periods of light snow and rain along with low cloud and fog so getting north has been a bit problematic. But that is life in the fast lanes... We may try to get up to Eureka later today but I am not betting the farm. 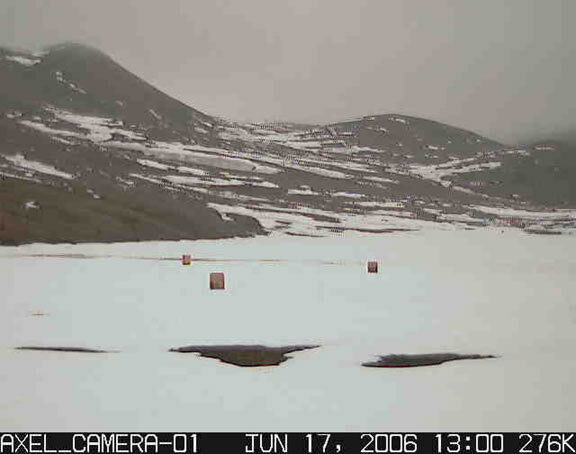 Hard to believe that we started blogging from the McMurdo Dry Valleys in the Antarctic nearly ten years ago. I know that "blog" along with the images have been available online at your astrobiology website since. Andrey Bekker of NAI's Carnegie Institution of Washington Team and his colleagues have an article in press for Precambrian Research which details the carbon isotope record for the carbonate platform in the Great Lakes area. The Outer Planets Assessment Group is a NASA-supported forum for scientists and engineers to discuss exploration of the outer solar system and to enhance communication between community and NASA. The meeting of the Outer Planets Assessment Group held at the Westin Hotel, Pasadena, CA 4-5th, 2005 was attended by ~80 people. 1. How does life begin and evolve? 2. Does life exist elsewhere in the universe? 3. What is life's future on Earth and beyond? The program consists of four independent R&A elementsthe exobiology and evolutionary biology program, the Astrobiology Science and Technology Instrument Development program, the Astrobiology Science and Technology for Exploring Planets program, and the NASA Astrobiology Institute (NAI). Together, these were funded in FY 2006 at a combined level of $65 million, already down 13 percent from the FY 2005 program. The FY 2007 budget would cut the program again, to half its current level. This is projected to be a permanent reduction in the size of the program. Following on the recent Cassini discoveries of geysers, organics, and excess heat emanating from the south polar terrain of Enceladus, and the exciting implications of these findings for possible subterranean chambers of liquid water, we are forming an Enceladus Focus group to begin a community-wide conversation about this fascinating moon. A satellite session is scheduled for November 2, 2006, from 2-5 p.m., the day before the 22nd annual ASGSB meeting officially starts. The title of the session is "Small Satellites as Platforms for Science." Editor's note:The following list of 49 journal articles is a subset of life science research focusing on microgravity and spaceflight published in 2006. This is derived from a simple keyword search using PubMed. "The next generations of space life scientists perceive a bitter lesson that is difficult to assuage: as the result of a shell game of agency-wide reorganization, life science is no longer recognized or valued within NASA." 19-21 September 2006 Hirshhorn Museum, Smithsonian Institution, Washington, DC - Purpose: The purpose of this conference is to undertake a broad overview of the societal impact of space exploration, especially as illuminated by historical research. The purpose is not to conduct an exercise in public affairs or a debate over public policy, but to examine with rigorous research what the impact has been, both nationally and internationally. Led by the E/PO Leads from NAI's University of Arizona, teachers from across the country convened in Alberta, Canada this past weekend for a two day professional development experience focused on astrobiology science and the latest research in pedagogy, curriculum, instruction, and assessment. NAI congratulates Dr. Sean C. Solomon, Principal Investigator of Carnegie Institution of Washington's NASA Astrobiology Institute and Director of the Department of Terrestrial Magnetism of CIW, on his receipt of the Caltech Distinguished Alumni Award on May 20. Europlanet #1, European Planetary Science Congress 2006, Berlin, Germany, 18 - 22 September 2006 - The intention of the European Planetary Science Congress 2006 is to cover a broad area of science topics related to planetary science and planetary missions. The program of the congress will contain oral and poster sessions, and it will emphasize workshops and panel discussions in order to have a strong interaction between the participants. "NASA will host a media teleconference at 1 p.m. EDT Wednesday, June 7, about the discovery of carbon-rich gas around a young star that may be forming terrestrial planets. The discovery was made with NASA's Far Ultraviolet Spectroscopic Explorer spacecraft and will be featured in the June 8 issue of Nature."